I can’t remember a time where I thought I was normal. I always felt a little bit … off from my classmates and friends. There were times when I felt a little upset that I couldn’t be more carefree like my peers or develop that laid back, chill out type of attitude most of the kids my age seem to exude (because I’m sure there were others out there who felt the same way, they just did a better job at ‘being normal’). Which is why I appreciate Aunt Frances and her wisdom. 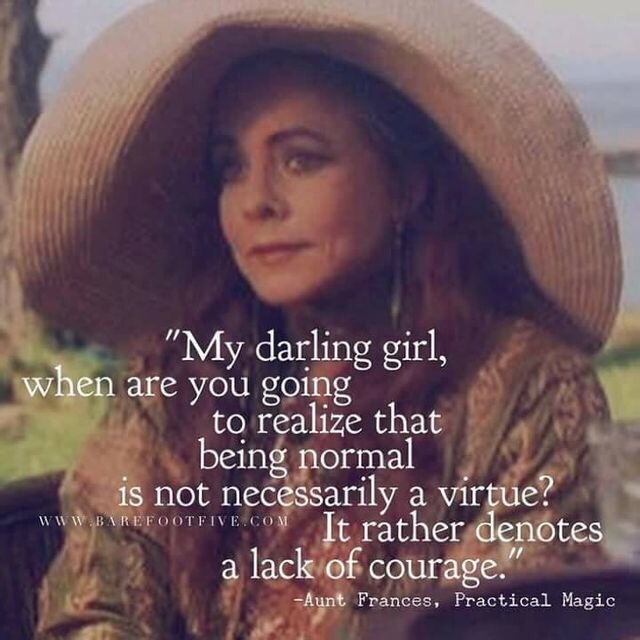 I’m not saying I’m courageous, but she made it a point to make me see that being normal may not necessarily be something everyone should strive for either. And what is normal anyway? Everyone has a unique personality with a blend of interests unique to them. What do others mean by normal? A community culture could behave and act a certain way but drive a few miles in another direction and that community culture would be very different, so wouldn’t that make someone not normal? Maybe we’re using the wrong word. Maybe we should be saying things like “I wish I could be more peaceful” or “I wish I could blend in” (but it does sound a bit boring compared to ‘normal’). All I can say is that normal doesn’t equal good or better. That being not normal does carry an air of courage. We wouldn’t have had the telephone, the computer, or moving pictures of those inventors were normal.